The Impetrabilis team is formed from a very strong group of qualified Document Management Professionals with many years’ experience designing, delivering and managing bespoke document management solutions to many global blue chip organisations. Through our many years of working for industry leading organisations we have discovered a wealth of opportunities to bring our years of experience and knowledge together to give the smaller businesses a fighting chance and compete with the larger corporates, and industry leading corporations who value honest, unbiased and independent expertise. Through bringing together our unique expertise, solutions and innovation we can deliver for you the same level of process efficiencies and cost benefits only normally afforded through significant investment. We are not driven through product placement or the need to sell copiers, printers, volume scanning or software licensing, we are just passionate to help business move forward in the business process and technological world. A no obligation initial meeting that will enable us to understand your issues, drivers, strategy to implement a new solution or review and develop an existing solution. It can be hard to believe that spending a couple of hours with a customer, generally discussing the corporate document processes and simply walking around their offices, will open up many opportunities for improvement. At Impetrabilis, we will do just that, invite us in, make us a coffee, talk to us and show us around. We will then discuss ideas and potential options and provide a short report on what we believe can be achieved. We may tell you what can be done but to find out how to achieve it you will need to engage us (or anyone else) to help you deliver it. Our Fees We like to work on a retainer basis, you engage us for an agreed number of days and use those days over a period of time to suit your business and project needs. The more days you commit to the cheaper the day rate. Retainer days do not expire so if things are quiet, save them until you really get busy or have a new project. A well respected and connected industry specialist with extensive solution design and operational delivery experience. Ashley’s career over the 30 years he has spent in the Document Services sector has focused on Business Management, Strategic Operations, Solution Design and Consultancy for global corporations including; Ricoh Europe, Ricoh UK, Aktrion Group, The OCS Group, Pitney Bowes, Danka, The Virgin Group and Kodak – all within the Document Management and Business Process Outsourcing arena. Prior to going ‘freelance’ in 2010, Ashley was the Director of Operations and Outsourcing at Apogee Corporation taking responsibility to enhance operational service delivery. He has a customer centric and process driven approach, a natural tendency to challenge convention and unique leadership skills. For the previous 10 years of his career Ashley was Commercial & Operations Director for the OCS Group. He accepted the challenge to develop a new Document Management division for OCS. The brief was to develop sales, operational and administrative teams together with an offsite ‘Document Lifecycle Centre’ to support site based operations. 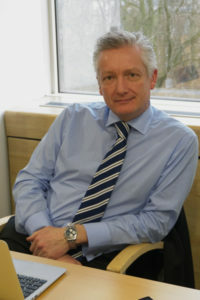 Within his last five years at OCS Ashley spearheaded the growth of the business unit through successful £5m+ contract development for blue chip clients including Lotus Cars, Hill Dickinson LLP and Government Offices Network, resulting in a successful business that included UK wide client site based operations and a centralised off site print, distribution and electronic mail solution. Ashley is technically and operationally competent which enables him to deliver value for money solutions, which yield tangible benefits for every customer. A qualified Document Management Consultant and a respected Operations and Outsourcing specialist, Ashley has been instrumental in the development and management of multi-million pound businesses focused on the lifecycle of the document. With a customer centric and process driven approach, a natural tendency to challenge convention and unique leadership skills, Ashley will ensure that the solution and support infrastructure for clients will be industry leading and robust enough to support future growth of the clients business. Quote: “When I hear the common phrase because we’ve always done it this way… I get excited with the fact that I know that there is an opportunity to improve the task. Operational Service delivery needs to be dynamic, adaptable to exceed the needs of the customer, changes in technology, business strategy and the economy”. Ashley has a wealth of senior management experience within the public and private sectors. He has completed a number of professional and personal development programs and regularly keeps abreast of market and technology developments through seminars, forums and events. Ashley is also affiliated to a number of recognised industry bodies, a professional member of Aiim and BIFM is also ITIL qualified and a Certified Document Imaging Architect (CDIA+), the only international industry recognised document management qualification. Ashley has gained substantial experience in the full spectrum of document management. He has the proven ability to deliver solution and service based contracts effectively and efficiently to both large corporates and medium sized enterprises. Keith has 26 years experience in the IT industry with a wide range of roles including service design, service delivery management, service transition, procurement, project management, service desk and technical support. 19 years experience in the print and imaging industry. Experience of working within large Public and Private Sector organisations. Alan started his career in manufacturing. As a qualified engineer he has had senior management and board roles heading up operations in a variety of business sectors. He specialised in process reengineering and the on-boarding of new products and technology. In 2000, now with an MBA, he switched to document management where his process, technical and business knowledge proved invaluable. He is highly competent as a consultant, subject matter expert, solution designer and analyst, as well as being competent at reengineering business processes. Alan has designed and built document management solutions embracing digital mailrooms, multi-channel document capture and delivery, cloud solutions including multi-country records management and rules based automated workflow. He has worked for large corporations and independently delivering document management services and solutions to customers including GE, May Gurney, Metropolitan Police, TUC, Cigna, Suzuki, Worldcom, Chubb, Westminster City Council and many more. Steve has been involved in the Reprographics, Scanning (Inbound, Outbound, ECM), Data Management (CCM, CXM), Mail and Records Management industry for over 27 years, his extensive technical knowledge and experience spans industry specialists such as Xerox, Fuji Xerox, Pitney Bowes and Williams Lea, OCS across Europe, Asia and the US fulfilling a variety of senior management roles. Steve has worked with many clients both in the Private and Public business sectors, providing quality cost effective solutions. He has provided distinct individual systems that solve single business issues, through to embracing highly comprehensive multi-service solutions that direct a companies architecture and business workflow. He has the unique ability to see beyond solutions and concentrate more on the specific requirements of the business, communicating with key stakeholders at all levels to ensure a complete fit for purpose delivery model is achieved. Steve’s aim is to create leading edge Document Management Centre of Excellence solutions, which delivers solutions that are intuitive; customers focussed and deliver real business advantage to clients. The concept aim is to merge people, process and technology into seamless operations that deliver real value to the customer and can grow with the organisation. It is also his belief that solutions need to be credible at all levels and fully supported by the people who work, as well as receive the output from the offering. Steve looks forward to the potential opportunity of working in true partnership with clients. He also looks forward to engaging with all levels of the project from solution brief, design and implementation of the project and latterly live and operational planning and continuous development, working with all key stakeholders to fully understand your vision and aspirations, and then ensuring delivery. Geoff is an experienced and innovative strategic business leader and project management professional. His outstanding track record in delivering cost efficiencies, improved business services and innovative industry solutions is combined with an impressive career history of formulating, leading and implementing strategic business changes. Geoff has worked with many blue chip organisations including: British Gas, Danka, Kodak, JPMorgan Chase, Goldman Sachs, Barclays, Citigroup, Pitney Bowes Inc. and CHEP.